The NH Upper Valley Region includes the vibrant towns of Hanover, West Lebanon and New London. The Lake Sunapee area also features some wonderful camp sites and has a long history of providing outdoor recreation – Dartmouth’s Winter Carnival dates back dozens of decades. Ask about Upper Valley NH Campgrounds or share reviews and comments. 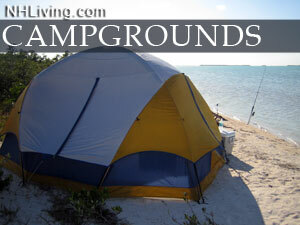 To feature your NH campground, contact us. Located on Great East Lake with 100 wooded acres and plenty of room for well spaced sites. A unique camping opportunity for couples. Scenic grounds and a sunny shorefront are tranquil backdrops for the weekend or the season. An executive golf course, a clubhouse for social events, a field for picnics and rallies. Our winding roads offer a mile of shady walking to the swimming area and docks. Ride your bike or walk another path to find the Clubhouse for golf, a dinner, Bingo or other event. 130 sites have water, electricity, sewer and the option of telephone service, or cable. Internet service is available in the Clubhouse. Located in the Heart of the Lakes Region, Silver Lake Park Campground offers lakeside camping with spectacular sunset views. Specializing in seasonal camping with gated access, Cabin Rentals, Traditional Camping, Boat Rentals, Planned Activites, and affordable rates. Located on the northwest shore of scenic Ossipee Lake, Westward Shores features cottages for any size group and campsites for short-term or long-term stays. New seasonal campsites available now! Amenities include an inflatable water park, full-service marina, snack bar, restroom and laundry facilities, and much more. Discover NH Campgrounds and RV Parks in every region. Great North Woods, White Mountains, Lakes Region, Dartmouth-Sunapee, Monadnock, Merrimack Valley and Seacoast.